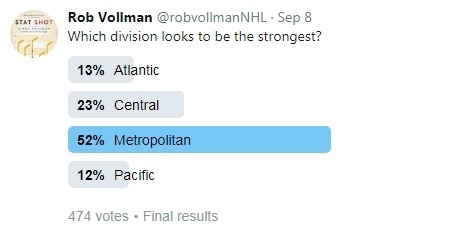 It might be a case of recency bias, but 52% of poll respondents said that the Metropolitan is the strongest division. The Central division looks quite strong to me, but it was barely ahead of the other two. It's a little surprising to see that 1-in-4 fans think that either the Atlantic or the Pacific are the strongest division. And, still on the topic of recency bias, the Penguins are the current favourite to win the Stanley Cup. Three in a row would be incredible. There are quite a few surprises at the top of the list list, but not as many at the bottom. If I had to choose one of those at the bottom, I'd probably bet on the Carolina Hurricanes at 66/1. Also, the Ottawa Senators came within a double-overtime bounce of making the Stanley Cup, and yet they're at 40/1. That's the worst of any playoff team, well behind the St. Louis Blues at 28/1. Finally, you've probably noticed that the Athletic has been scooping up virtually every available hockey writer. That includes prominent hobbyists, and long-time professional journalists. Quite frankly, it's easier to list those that aren't with the Athletic than those who are. I'm looking forward to seeing their coverage. This marks another turn in the history of our field. 15 years ago, our small community could be found in two places: a collection of blogs known as the Oilogosphere, and a Yahoo discussion board called HAG started by Iain Fyffe. Just under a decade ago, we all spread out over a collection of three websites, the Nations Network, SB Nation, and Hockey Prospectus. A few years ago, the last of those three faded away, and its spot was replaced by Hockey Graphs (but without the annual guide books). Now, it seems like a lot of the community is being brought together under the Athletic. I'm really interested to see what can be achieved with so many people in our field working together, all in one place, and with the necessary resources to succeed. I think each of these other sites aimed to achieve the same goal, but was never really able to break into the mainstream, or become particularly lasting and/or profitable for all of those involved. After all these years, I'm really hoping that our time has finally come.